I have just started reading Fifty Shades Of Grey series for the second time. Now I chose to read Lone Wolf by Jodi Picoult at the beginning of the month. slow I've been reading in recent months. and make a fateful decision. Cara who was once protected by her father is tormented by a secret. and now his fate hands in the balance of her two children who both want different things. 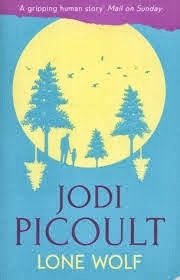 I normally love Jodi Picoult novels but I have to say I was hugely disappointed. I found that unlike her other books the characters were rather boring in Lone Wolf. Although this was a disappointment I won't be letting it put me off reading more of her books.